Go to original pattern for design DROPS 103-24. A set of: Crocheted DROPS beret in ”Alaska” and knitted scarf in ”Puddel”. 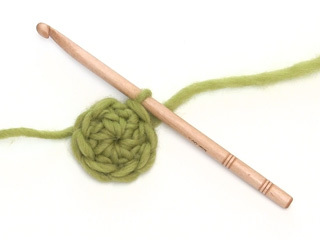 DROPS Crochet hook size 5 mm - or the size needed to obtain 14 tr x 8 rounds on 10 x 10 cm. 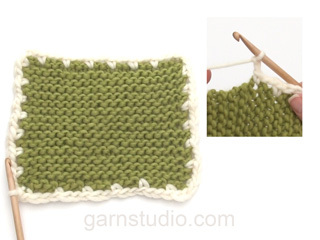 Crochet info: Substitute first tr on round with 3 ch. Rounds ends with 1 sl st in 3rd ch in the beg of row. Substitute first dc on round with 1 ch. Round ends with 1 sl st in 1st ch in the beg of row. Decrease tip: Dec 1 tr like this: Crochet 1 tr, but wait with last “pull through” (= 2 loops on hook), crochet another tr but on the last pull through pull the yarn through all loops on hook. Check your crochet tension! 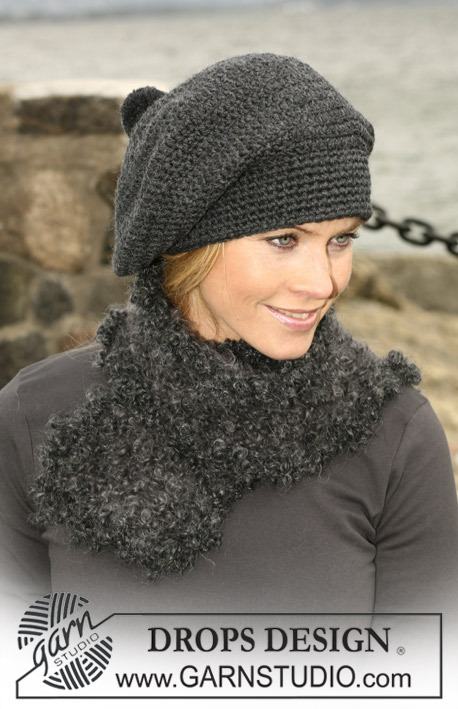 The beret is crocheted from top and down. Crochet 10 ch with hook size 5 mm and Alaska and form a ring with 1 sl st in first ch. 1st round: Read Crochet info! Crochet 20 tr on ring. 2nd round: * 1 tr in first tr, 2 tr in next tr *, repeat *-* = 30 tr. 3rd round: * 1 tr in first 2 tr, 2 tr in next tr *, repeat *-* = 40 tr. 4th round: * 1 tr in first 3 tr, 2 tr in next tr *, repeat *-* = 50 tr. 5th -9th round: Continue the same way but with 1 more tr between every inc (i.e. inc 10 tr per round) = 100 tr. 10th-16th round: Crochet 1 tr in every tr without inc.
Then put 10 marking threads in piece with 10 tr in between. Continue to crochet in the round with tr, at the same time dec 1 tr on left side of every marking thread on every round – read Dec. tip! Crochet a total of 3 rounds with dec = 70 tr. Continue crocheting the beret to finished measurement with double thread. Crochet 1 round with 1 dc in every tr, then crochet 7 rounds with 1 dc in every dc. Cut and fasten the thread. Pompon: Make a pompon with a diameter of approx 5 cm. Attach the pompon on top of the beret. DROPS Crochet hook size 7 mm – for crocheted edge. 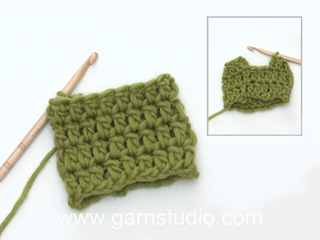 Knitting tension: 10 sts x 14 rows in stocking stitch = 10 x 10 cm. Scarf: Cast on 15 sts on 2 needles size 7 mm with Puddel (this will make the casting on edge elastic). Pull out one needle and K1 row from WS. Continue in stocking stitch until piece measures approx 79 cm. K1 row from WS. Cast off loosely. Crocheted edge: Crochet 1 round around the scarf with hook size 7 mm like this: 1 dc, * 4 ch, skip approx 2 cm and crochet 1 dc in following st *, repeat *-*. Buongiorno Simona. Con la tensione indicata nel modello, quando arriva ad avere 70 m.a, la circonferenza sarà di circa 50 cm. Buon lavoro! What is the finished mmeasurement for the hat? Dear Lisa, with a tension of 14 dc = 10 cm, you will have approx. 50 cm circumference when working the 70 dc. Adjust to your size if required ading more inc/dec. Happy crocheting! Thanks for answering my question on Dec 9th so quickly. The hat came out great. The pattern seems like you do rounds 10 - 16 with one dc in each stitch then start decreasing on the 17th round for 3 rounds. However your comment on 01.09.2008 sounds like you only do one round with 1 dc in each stitch, then decrease for three rounds and then 3 rounds with one dc in each stitch. This is fewer rounds over all. Which is right? Thanks. Dear Roberta, pattern is correct, work first 7 rounds without 1 dc in each st (round 10 to 16), then dec on next 3 rounds. Happy crocheting! Bonjour Mme Beaufrere, c'est exact, on place 10 marqueurs et on diminue 1 m à gauche de chaque marqueur (= après chaque marqueur) = 10 dim et on répète 3 fois ce tour au total, on va diminuer 30 m, il en reste 70. Bon crochet! Just finished this hat, and it is a great slouchy beret! the double yarn in the hat band is just perfect for keeping my ears warm. I used yarn leftover from a heavy worsted weight sweater with an H hook, and it fits my medium sized head well. Thanks for this great looking pattern. I know that you have a note, but it might be helpful for beginners if you include in the instructions at the beginning of each round. For example...ch3 (or standing dc) in first st, 2dc in next st etc. I hope this helps those new to crochet. Forse ho capito ... non devo iniziare il 17° giro con le catenelle, ma proseguire a tutto tondo, giusto? Buongiorno Elisabetta. Si lavora sempre in tondo. Può posizionare i segnapunti p.es il primo dopo le prime 3 m , il secondo dopo 13 m, il terzo dopo 23 e così via fino all'ultimo, che sarà dopo la 93a maglia. In questo modo ha sempre almeno 2 m.a dopo ogni segno e riesce a diminuire come indicato senza che questo interferisca con le 3 cat iniziali. Buon lavoro!